Julie® comes to full maturity in late Autumn. The original tree was growing as a chance seedling beside an old shed on the Shields property, which has been an orchard since the early 1900’s. The tree was observed to have some fruit about 1992 after apple trees were planted nearby. A number of trees were propagated in 2002 using plant material from the original tree and grafted on to M26 stock. 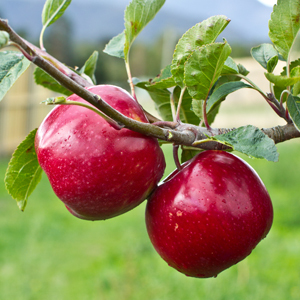 Julie™ was planted in an orchard situation in 2003 and was producing small quantities of fruit in 2005. Observations of the fruit produced have shown consistently to original characteristics. No regression has been observed.In September 2008 the variety was placed in the Australian Pome Fruit Improvement Program for evaluation. The trial sites are located at 3 sites in Australia – Huonville in Tasmania, Adelaide Hills in South Australia and Shepparton in Victoria.Shield applied for Plant Breeders Rights and provisional acceptance was granted 28/02/2012. Trees in comparator trial have had fruit on this year (2014).Currently there are about 350 trees in the ground from 1 year to 10 years old. In 2013 Shield placed a small number of trees with commercial orchards at Orange, Batlow, Darkes Forest and Stanthorpe. There will be around 4000 trees in commercial orchards in 2014. August 2014 applied for ‘Julz’ trademark for use overseas. Commenced trademarking in 46 countries in March 2015.